Perfect Binding is “Paper-Back” binding, just like major publishers use. 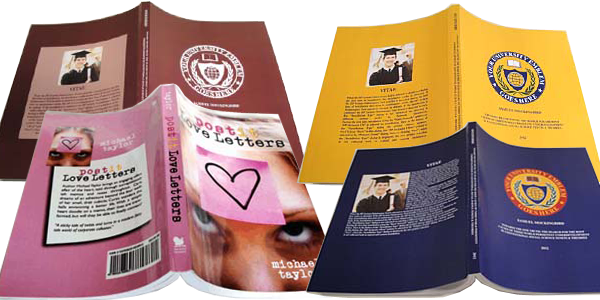 The cover is one piece, printed with the information or graphics you choose. Perfect binding provides you with great flexibility – print in full color on the wrap-around cover, including text for your book’s spine. Saddle-Stitching is a soft-cover binding option that involves attaching the contents of a printed document to the cover with staples to make a booklet that can open completely flat. As a result, the cover has no spine area. 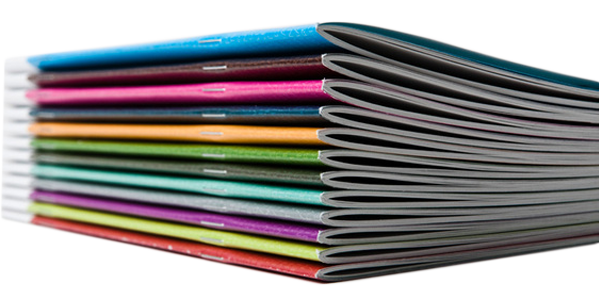 Saddle Stitching allows for printing full color wrap-around photographs and designs on our super-smooth, heavy-weight card stock cover. We offer free cover layout for Basic Designs. Click here to see samples of the free basic cover designs that we offer. If you want an elaborate or complex cover design, you need to supply it in a file format that we can open, such as PDF.